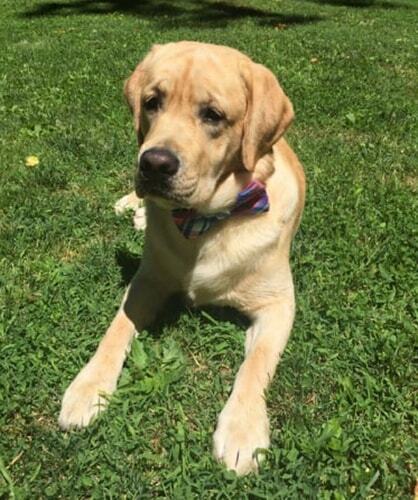 My yellow lab, who would have been two years old next week, was hit by a car. I had gotten off work and picked him up from puppy day camp. On the way home, he was hanging his head out the window with a huge smile on his face just like he did every day. A car stopped short in front of me, and I had to hit my brakes faster than usual. Murphy got scared and his reaction was to jump out my window. The second he hit the ground, a car was right there. They didn&apos;t even have one second to try to swerve or hit their brakes. Neither of them meant for this to happen. I literally pulled into someone&apos;s front yard and ran to Murphy. As I got close, I saw him pull his left front leg toward him and he yelped. I can still hear that yelp today, three weeks and one day later. I hugged him and he was not blinking. I checked for a pulse and was relieved to find one, but he was not moving. I started giving him CPR and yelling at cars to call 911. The driver of the car got out and kept saying, "He&apos;s okay, he&apos;s okay." No, Murphy wasn&apos;t okay. I stopped CPR and hugged him, and I felt his body relax and fade away. I knew I’d lost him at that moment. I can&apos;t seem to shake the flashbacks and replaying every second of those ten minutes in my head. A police officer showed up, and as he was walking toward me he said on his radio, "It&apos;s just a dog." I began screaming at him to help me until he finally said, "Ma&apos;am, there&apos;s nothing I can do," not even coming near Murphy. Three people who stopped helped pick Murphy up and get him in my car, yelling at me to get to a vet. As I pulled away, my brother called that he was right behind me. I pulled over and he jumped in, sitting in the backseat with Murphy. I drove the shoulder in rush-hour traffic down two highways to get to an emergency vet. A police car signaled for me to pull over, but I kept going. As I got to the vet and the techs ran out to my car, they confirmed what I knew was true but did not want to hear—Murphy did not have a pulse. I went inside and felt numb. I couldn&apos;t cry. I felt like I was going to throw up. This couldn&apos;t be real. Three weeks and one day later, it still doesn&apos;t feel real. Murphy did not deserve for this to happen. He didn&apos;t mean for it to happen. I have a tremendous amount of guilt and "what ifs." If I’d left work one minute earlier, this wouldn&apos;t have happened. If I’d driven two miles an hour slower, Murphy would still be here. If I’d had the window up halfway, my best friend would still be with me. I can&apos;t help but think that this was my fault. I have not been able to go one day without crying. This is 100 percent the worst thing I have ever witnessed and experienced in my life. I can&apos;t seem to shake the flashbacks and replaying every second of those ten minutes in my head. I would not wish this pain on anyone. I spent the first five days in bed, not talking to anyone, not eating, not living. The next three days back to work were just filled with tears as everyone approached me with their "I&apos;m sorry" hugs. Exactly one week after I lost Murphy, my dad forced me to go to therapy. I already have anxiety, and now it is tripled. The anxiety, depression, guilt, sadness, anger … it&apos;s too much for me to cope with. I have never believed in therapy, but I knew I needed guidance. I have now been three times. But when I really sit and think, I’m doing better than I was the day after “it” happened. Last weekend was the first time I drove other than to and from work. I drove to my boyfriend&apos;s house thirty minutes away and had a breakdown the second I got there. I am truly scared driving. I stood outside for about ten minutes to get myself together before I could go inside and greet his dog. I was surprisingly happy to see her. The next day, I drove my car home. I did not cry, but when I got home I had a raging headache and was very nauseous. Every time I get in or out of my car, I can&apos;t help but look at that back window and see Murphy&apos;s face. Last Sunday I went out with friends for the first time. I had to walk away twice to cry, but overall I did have fun, and I laughed. If someone asked me if I’m doing okay, I would say no, I&apos;m not okay. I&apos;m broken. I&apos;m traumatized. But when I really sit and think, I’m doing better than I was the day after “it” happened. I take steps every day to be happy again. I’m trying. Sometimes I need to be left alone, and sometimes I need to cry, but deep down I know I’m trying. I have been told by many people, including my therapist, to write down my thoughts and feelings. Being an English and writing major I thought this would be easy, but I could not bring myself to do it. Not until I read Option B and joined this website.